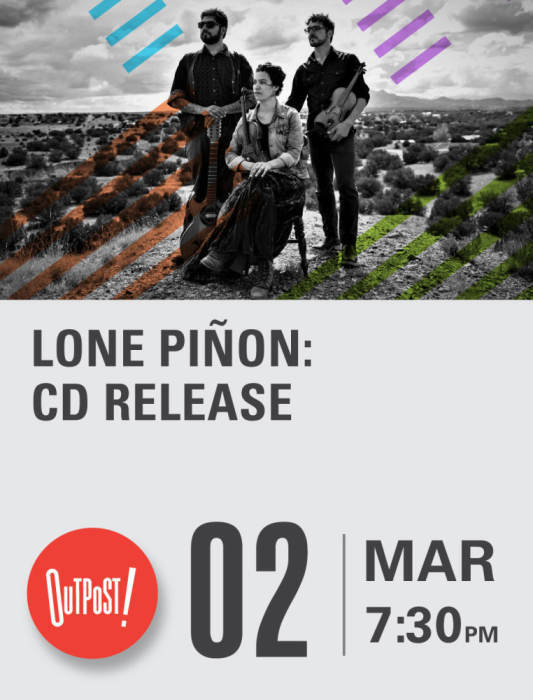 A conjunto of young musicians from Santa Fe and Albuquerque, Lone Piñon is dedicated to the study and revitalization of our region's musical roots. Founders Noah Martinez (guitarrón, quinta huapanguera, tololoche, bajo sexto) and Jordan Wax ( ddle, accordion, vocals) had played professionally in a variety of other styles, and in 2013 they began an exploration of violin-based Northern New Mexico dance music rarely heard since the 1950s. Far from the isolated and quaint picture that is often painted of Northern New Mexico traditions, they quickly discovered New Mexico’s musical landscape to be a rich tapestry of intercultural connections and stylistic crossroads, and, for the past ve years, the strands of those interwoven cultures have, as they put it, led them on a musical trajectory that transcends generations and borders. 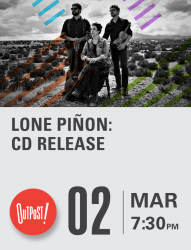 Joined by Leticia Gonzales on violin, they celebrate the release of their third album, Dále Vuelo, a full-length studio album that showcases the musical ground they've covered with a special emphasis on the double- ddle traditions of the Rio Grande Valley and their kinship with regional Mexican styles.